The Great Thar Desert and the Aravalli range of mountains are two distinct geographical features in Rajasthan. In fact, the Aravalli range which runs through the state from southwest to northeast, almost from one end to the other, for more than 850 km regulates the weather pattern here. A number of rivers originate from these peaks and ridges. Mount Abu lies at the southwestern end of the range, separated from the main ranges by the West Banas River. A series of broken ridges continues into Haryana in the direction of Delhi where it can be seen as outcrops in the form of the Raisina Hill and the ridges farther north. About 75% of Rajasthan lies northwest of the Aravallis, leaving the rest 25% on the east and south direction. The northwestern Rajasthan is generally sandy and dry. Most of this region is covered by the Thar Desert which extends into adjoining portions of Pakistan. The Aravalli Range does not intercept the moisture-giving southwest monsoon winds off the Arabian Sea, as it lies in a direction parallel to that of the coming monsoon winds, leaving the northwestern region in a rain shadow. The Thar Desert is thinly populated. Bikaner is the largest city in the desert region of Rajasthan. The northwestern thorn scrub forests lie in a band around the Thar Desert, between the desert and the Aravallis. This region receives less than 40 cm of rain in an average year. Temperatures can exceed 45°C in the summer months and drop below freezing in the winter. The Godwar, Marwar and Shekhawati regions lie in the thorn scrub forest zone, along with the city of Jodhpur. The Luni River and its tributaries are the major river system of Godwar and Marwar regions. The river and its steams drain the western slopes of the Aravallis and emptying southwest into the great Rann of Kutch wetland in neighbouring Gujarat. This river is saline in the lower reaches and remains potable only up to Balotara in Barmer district. The Ghaggar River, which originates in Haryana, is an intermittent stream that disappears into the sands of the Thar Desert in the northern corner of the state. According to some, Ghaggar River is seen as a remnant of the primitive Saraswati river. The Aravalli Range and the lands to the east and southeast of the range are generally more fertile and better watered. This region is home to the Kathiarbar-Gir dry deciduous forests and its eco-region. The tropical dry forests include teak, Acacia and other trees. The hilly Vagad region home to the cities of Dungarpur and Banswara lies in southernmost Rajasthan, on the border with Gujarat and Madhya Pradesh. 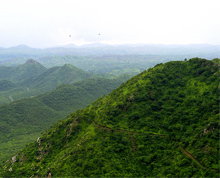 With the exception of Mount Abu, Vagad is the wettest region in Rajasthan, and the most heavily forested. North of Vagad lies the Mewar region, home to the cities of Udaipur and Chittaurgarh. The Hadoti region lies to the southeast, on the border with Madhya Pradesh. North of Hadoti and Mewar lies the Dhundhar region, home to the state capital of Jaipur. 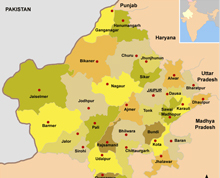 Mewat, the easternmost region of Rajasthan, borders Haryana and Uttar Pradesh. Eastern and southeastern Rajasthan is drained by the Banas and Chambal rivers, tributaries of the Ganges. The Aravalli Range runs across the state from the southwest peak Guru Shikhar (Mount Abu), which is 1,722 metres in height to Khetri in the northeast. This range divides the state into 60% in the northwest of the range and 40% in the southeast. The northwest tract is sandy and unproductive with little water. But the soil condition improves gradually from desert land in the far west and northwest to comparatively fertile and habitable land towards the east. The vast northwest belt area includes the Thar Desert. The south-eastern area, higher in elevation (100-350 metres above sea level) and more fertile, has a much diversified topography. In the south lies the hilly tract of Mewar. In the southeast, a large area within the districts of Kota and Bundi forms a tableland. To the northeast of these districts is a rugged region (bad lands) following the line of the Chambal River. Farther north the country levels out; the flat plains of the northeastern Bharatpur district are part of an alluvial basin. Merta city lies in the geographical centre of Rajasthan. Rajasthan has a wide range of climate that varies from extremely arid to humid. The humid zone spans the southeast and east. Except in the hills, the heat during the summer is intense everywhere, with temperatures in June — the warmest month — typically rising from 30°C to nearly 40s°C daily. Hot winds and dust storms occur in the summer, especially in the desert tract. In January — the coolest of the winter months — daily maximum temperatures range from the low to mid-20s°C. While minimum temperatures are generally range around 7°C. The western desert has little rain, averaging about 10 cm annually. In the southeast, however, some areas may receive almost 50cm per annum. Southeastern Rajasthan benefits from both the Arabian Sea and Bay of Bengal branches of the southwest (summer) monsoon winds, which bring the bulk of the annual rainfall. Though a large percentage of the total area is desert with little forest cover, Rajasthan has a rich and varied flora and fauna. The natural vegetation is classified as Northern Desert Thorn Forest. These occur in small clumps scattered in a more or less open forms. The density and size of patches increase from west to east following the increase in rainfall. The Desert National Park in Jaisalmer is spread over an area of 3,162 sq. km. 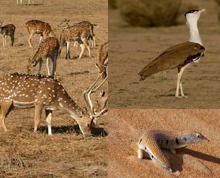 It is an excellent example of the ecosystem of the Thar Desert and its diverse fauna. Seashells and massive fossilised tree trunks in this park record the geological history of the desert. The region is a haven for migratory and resident birds of the desert. One can see many eagles, harriers, falcons, buzzards, kestrels and vultures. Short-toed eagles, tawny eagles, spotted eagles, laggar falcons and kestrels are the common birds in the Thar Desert. The Ranthambore National Park located in Sawai Madhopur, one of the finest tiger reserves in the country, became a part of Project Tiger in 1973. The Dhosi Hill located in district of Jhunjunu, known as 'Chayvan Rishi's Ashram', where 'Chayawanprash' was formulated for the first time, has unique and rare herbs growing. The Sariska Tiger Reserve located in Alwar district, 200 km from Delhi and 107 km from Jaipur, covers an area of nearly 800 sq. km. The biological reserve area was declared a national park in 1979. Tal Chhapar Sanctuary is a very small sanctuary in Sujangarh (Churu district), 210 km from Jaipur in the Shekhawati region. This sanctuary is home to a large population of blackbuck. Desert foxes and the caracal, an apex predator, also known as the desert lynx, can also be spotted, along with birds such as the partridge and sand grouse. The great Indian bustard, known locally as the godavan which is a state bird, has been classified as 'critically endangered' since 2011.